The WARRNAMBOOL SYMPHONY ORCHESTRA Inc. was formed on 4th August 1988 at the instigation of Mrs. Robin Wright, a prominent musician and piano teacher, on her return to her native home, Warrnambool. The orchestra has been in continuous operation ever since. The orchestra rehearses between 7.30 and 9.30 p.m. on Monday evenings, except for school and public holidays, at the Welsford Auditorium, Warrnambool college, Grafton Road, Warrnambool. Our players are amateur musicians ranging from school and university students to music graduates and teachers. There is no audition requirement. The orchestra also operates the Robin Wright Strings group, which is open to developing string players of any age. This group meets each Monday between 6.00 and 7.00 p.m. before orchestra rehearsals and once players feel sufficiently confident, they join the orchestra. 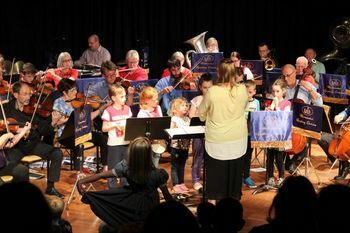 In a typical year the orchestra performs a Mothers Day concert, a day time concert for students, staff and parents at Warrnambool Primary School, a day time performance in the foyer of the Warrnambool Base Hospital for patients, staff and visitors, a cabaret style concert and a concert specifically designed to be of appeal to children. Consideration is being given to mounting a workshop/concert involving young music students in a nearby outlying town. The orchestra performs original new works by local composers. New players are always welcome. Please CONTACT US to express interest.